His Eye is on the Sparrow by Heartstring Samplery - 40 ct. Doubloon by Picture this Plus, GAST and WDW (1 over 2). 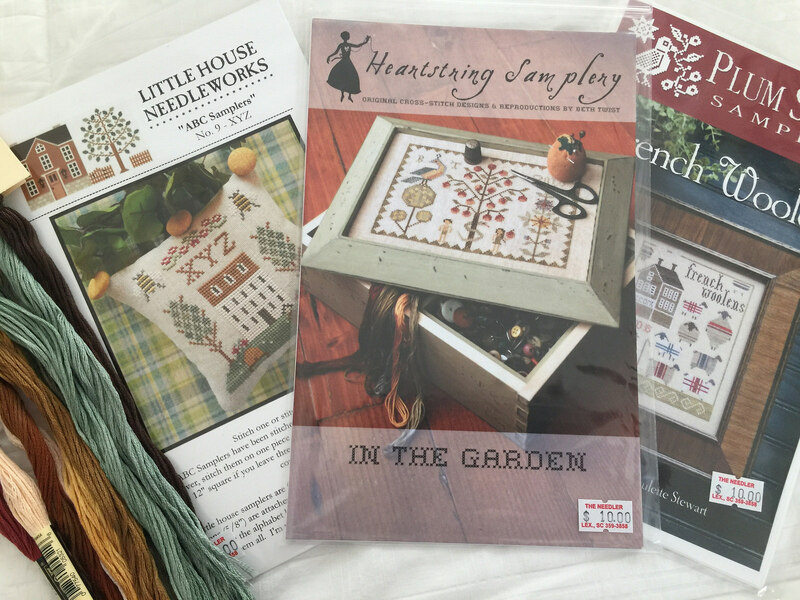 Cross Stitch Nation by Heartstring Samplery - 36 ct. Wren by Picture this Plus, CC, GAST and WDW (1 over 2). Toe-up Vanilla Socks - Phydeaux Designs Chaussette "Calypso." Size US 1 (2.25 mm) Nova Platina circular needles. Summer at Hollyberry Farm by Stacy Nash - 40 ct. Vintage Fawn, GAST (1 over 2). 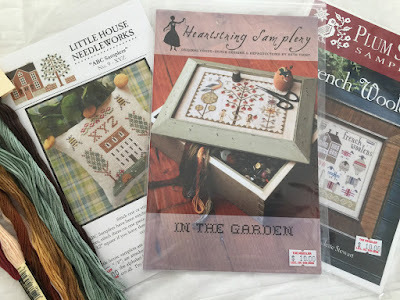 Heartstring Samplery "In the Garden," Plum Street Samplers "French Woolens," and Little House Needleworks "ABC Samplers - XYZ." Nice video; you have some pretty additions to your stash. You mentioned the Smith Sampler from Scarlet House...would you use 46 count with the silks? I love that sampler, but trying to manage a "stash diet"(LOL)...we will see. Totally agree with you on Doubloon; I will have to use mine for something else also. Found another stitcher blog, Three Sheep Studio, using Vintage Country Mocha. so will stop by In Stitches (my LNS) for a floss toss to make sure it works on 40 count. Best wishes and happy stiching! Beautiful projects! I tried some 40 count years ago and I had to really push the 28 needle through it, so I think it was dense too. Wichelt linen is thinner than Zweigart and any dying will shrink both a bit-guess you have to experiment! And I don't care for really splotchy dyed linen either. I love your video and your projects...they're exactly my taste. Seeing your WIPS is so motivational. I was feeling lazy today but am totally going to dig out a project after seeing your progress. Thanks for taking the time to detail the names of the designs, I added two more to my list! Loving all your stitching choices and especially the linens you are using. Your colour choices are lovely. Think I will have to look up some of the places that dye linens and maybe get some.Your knitting is beautiful also, I too love knitting shawls and socks and daren't tell you how many I have on the "go". I enjoy watching your videos Nicole, look forward to your next entry. Oh Nicole, your piece "His Eye is on the Sparrow" is so lovely. It would be a hard decision to decide to start over. I don't think I could bring myself to do it. :~( I'm working on a Quaker sampler, first time, and loving it ... using all red variegated floss. I so enjoy your videos. You keep me motivated.